3D printing is reinventing industries, and fashion is no exception. 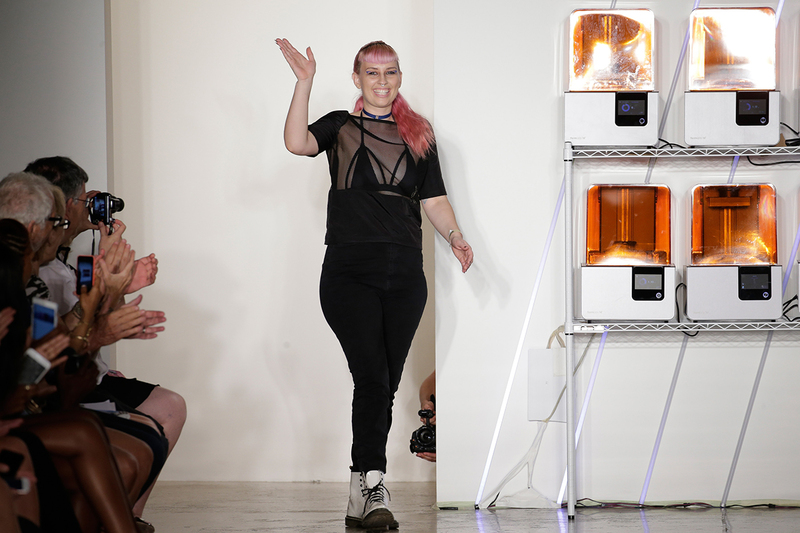 Attendees of Chromat’s New York Fashion Week (NYFW) runway show may have noticed an unlikely presence on the runway&ndash;glowing orange Form 2 3D printers whirring in the backdrop of a diverse set of models showcasing the brand’s SS17 HYPERWAVE collection. The Form 2 also made an appearance at Chromat’s pop-up shop, where visitors had the chance to interact with what was live printing during the show: 3D forms created from body scans of dancer and choreography Mela Murder, who performed on the runway. Featuring 3D printing was a natural fit for Chromat designer Becca McCharen-Tran, who draws from her training in architecture to create cutting-edge, tech-inspired fashion. She took us behind the scenes to tell us more about her NYFW concept, and how she sees technology and 3D printing’s impact on the future of the industry. What was the inspiration for infusing 3D printing into your runway show? I’m excited about the future of 3D printing and body scanning as a tool to enable people who are shopping online to be able to try things on visually. Eventually everyone will have a 3D printer and be able to print out their garments at home, leading to full customization, which is our end goal. We want every single body to have well-fit clothes that are tailor made for them. Fit is something we’re obsessed with and that’s why we show all different types of bodies on the runway and celebrate all of these amazing women; we want everyone to be able to wear Chromat and we want it to fit well. Formlabs shared live instastories and posts from the runway at NYFW. How did you use this concept throughout your NYFW presence? The collection was interpreted through movement by dancer and choreography Mela Murder. Before the runway show we worked with Body Labs to scan her body in six poses. At the runway show we had the poses being printed live, and then displayed them with the printer at our pop-up shop following the show. To cap it off we’re collaborating with PvssyCrevv to create a whole digital world for these body scans using virtual reality. We wanted to bring the 3D printing into the art context as well as fashion. A photo posted by CHROMAT (@chromat) on Sep 9, 2016 at 3:26pm PDT. Visitors to Chromat’s pop-up shop had the chance to interact with the Form 2 and 3D printed body scans of dancer and choreographer Mela Murder. How did runway show and pop-up show visitors respond to the 3D printers and body scan prints? People were excited. At the pop up shop I got to see visitors learning about the 3D printers, and ogling the 3D printed body scans of Mela. I know it’s something that a lot of people don’t have experience with, especially in the fashion world&ndash;it’s really exciting for them. Download .STL or .form files of the body scans from Chromat on Pinshape. You’ve done some 3D printing in the past. Why was Formlabs a good fit for this project? I think what you guys are doing is really amazing. You’re at the height of kind of high fashion and high design 3D printing and additive manufacturing; you understand, in a design sense, our aesthetic goals. Watch Chromat’s NYFW runway show, featuring a backdrop of Form 2 3D printers live printing body scans of dancer and choreographer Mela Murder.